This is a self-published mini that one will probably guess upon reading it serves as a sort of writing showcase for publisher Chris Arrant, working with four different artists. Chris Arrant is a popular on-line and I think in-print journalist about comic books. 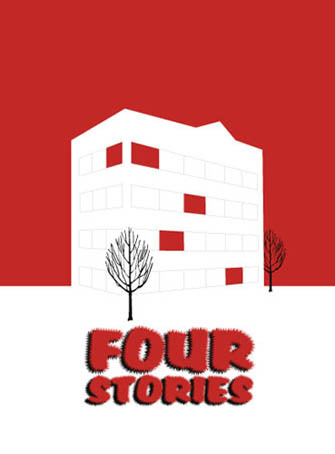 I wish I liked Four Stories better. The first thing that jumped out at me is that the cover typography uses a "furry" lettering that makes things it look off-register, and, further, that it's actually hard to tell if all of the lettering is supposed to be like that or just the title. That's one level of uncertainty too many. This feeling of confusion carries over to the comic and its wafer-thin plots. The stories presented here are more like scenes than stories: except for the first, "Integral," there's almost nothing in the way of development or build, and even there it's only very simple plot progression, a move from one place to another. The first two stories in particular beg questions -- what is the nature of the final tableau in "Integral"? what is the meaning of the vision in "Passenger"? -- that want answers. However, there's so little there, even with introductions provided by Arrant that fairly spell it out theme work for you (stories of this length shouldn't need introductions), that only the most generous reader will care about those answers. The result is a pair of stories that feel less like stories and more like showcases for a certain approach or technique. Which is fine, but I sure don't want to read it. The third story, "Snowblind," has a Twilight Zone twist that does nothing to shine a light on anything that came before it. In fact, the twist interrupts and spoils the best of the four ideas, that of an employee recovering from a disastrous performance at an office Christmas party. "Stuart," which deals with a boy doing odd tasks around a hospital, perhaps to carve himself out a moment of peace and quiet, proves the least ambitious narrative and therefore the one that works best in the limited treatment it's given. To its detriment "Stuart" ends up not doing much with its relative panel to panel density (either Arrant or artist Eric Adams -- or both -- displays/display an ability to break down individual moments into minute changes here) and turns on a forced parallel ending that seems implausible, if only from a timing circumstance. If this really is a writing showcase, I'd suggest more attention to the individual stories and less attention to the packaging and theme work. This feels like a university assignment, or something created with something else -- the calling card of a book, maybe -- in mind. I think Arrant will find that given room to develop on their own, one or two of these stories might not have made the cut, and others might have unfolded in much more dramatic fashion.